As a member of the Upper Peninsula Telehealth Network, our Telemedicine Service allows you to consult with your out-of-area healthcare provider — whether they're in the Upper Peninsula, lower Michigan or across the country. You and your healthcare provider will be able to discuss your care using high-tech video technology - without the aggravation of long-distance travel time, transportation concerns, or seasonal weather challenges. In a private exam room outfitted with specialized exam tools (i.e., patient exam cameras, electronic stethoscopes, and more) your provider will have access to all the information needed to monitor, review and discuss your treatment. Our Telemedicine System and provider appointments are coordinated by a Registered Nurse who is available to manage the medical equipment and provide hands-on assistance to the healthcare provider, thus allowing you to focus on your consultation. Your consultation is completely private and confidential, and the service is billed similarly to a traditional medical visit. 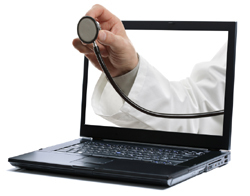 A wide range of specialists and other healthcare providers offer their services to established patients via Telemedicine for a variety of appointments, including patient consultation, surgical follow-up, maintenance care, and treatment review. Ask your provider if you may be able to save yourself the time a lengthy trip. Telemedicine helps enhance your care at HNJH in other ways, too. Our staff members and healthcare providers participate in continuing education programs through the Telemedicine system, keeping them up-to-date on the latest treatments and techniques. If you have questions or would like additional information, please contact our Telemedicine Coordinator by calling, 906.293.9128. For more information about the UP Telehealth Network, please click here.